Little nuggets of helpful advice and wisdom to help you shift into a happier, healthier way of life in just 2 minutes or less. Click on the video links below for your Transformation Tip of the week. Session 1 – Week One: “H2O” Increasing your water intake daily is an absolute MUST for improved health & wellness. Stimulates weight loss, removes toxins, supports internal organs, and skin LOVES it! Drink several glasses throughout the day, every day, in order to provide your beautiful body with optimal support. Put a fresh bottle on your nightstand before bed and drink it all down as soon as you wake up. Carry a reusable bottle with you and refill frequently, keep one in the car, add a little fresh fruit or sliced citrus for a flavor boost… just drink it up Buttercup! Click here to see my cute little 1-minute video! Session 1 – Week Two: “Ditch & Switch” There are so many different choices we make throughout each and every day, from the moment we wake up to right before falling back to sleep at the end of the day. We have the power to control everything we eat, drink, say, and do- so let’s choose the things that are the best for ourselves! What if we decided to ditch some of the things that are holding us back and switched them with things that benefit our health and well-being? Click here to view my simple Ditch & Switch worksheet. Session 1 – Week Three: “Take the Long Way” Strengthening your heart, lungs, and legs can be as simple as taking a walk. Strive to walk 10, 20, 30 minutes or more each day. Get a fresh perspective along with fresh air. Make a game of it with yourself by finding ways to sneak in a few extra steps when you are out running errands. Click here to view my cute little 1-minute video! Session 1 – Week Four: “Hello Gorgeous!” For the past month, we’ve been working on loving ourselves more. We’ve been changing the inner (and outer!) dialogue to create a space for ourselves that is loving, kind, caring, & peaceful- all while finding our strength and learning how to believe in ourselves. When you look in the mirror, instead of tearing down the image in front of you, take a real look into your eyes and see that beautiful, gorgeous, amazing soul inside. Write a little love note or encouragement to yourself on the mirror with liquid chalk, stickers, or permanent marker. Click here to view my cute little 1-minute video! Session 2 – Week One: “Clear Your Clutter” One of my patterns that I am trying to change for the better is that of collecting (and keeping!) clutter. Not only will clearing away and releasing clutter physically transform the space it occupies, but it transforms us by relieving added stress and creating a sense of calm and tranquility. Click here to view my cute little video! Session 2 – Week Two : “Pay It Forward” Whether or not you believe in karma, there’s nothing wrong with doing something kind for a total stranger. In fact, practiced regularly, it can be downright transformational. Your own “pay it forward” moment can be as simple as offering your place in line to the person behind you with just a few items (or to a parent with a tired/fussy baby in tow), holding the door open without expecting acknowledgement, or secretly paying for the order of the car behind you in the drive-thru. Putting goodness out in the universe is truly beautiful! Click here to view my cute little video! Session 2 – Week Three: “Create Your Verdant Life!” What are some ways that you can live a more lush, verdant life? Giving yourself regular, planned nature trips for a peaceful stroll or an energizing hike, cultivating a small garden of your own- even a tiny container garden- can be incredibly enriching. Got a “black thumb”? Not to worry, get your green fix by visiting a local public garden or daydreaming through the plant nursery. The more that we re-connect with Nature, the more we give a hoot about taking better care of our environment. Recycle what you can, conserve where you can, and give daily gratitude for the small, yet marvelous, space that you occupy. Click here to view my cute little video! Session 2 – Week Four: “Step It Up” Sometimes the best thing for developing a clear vision for your future is a long walk. This week, I encourage you take yourself on a nice, relaxing, non-agenda walk and see what a change of scenery does for you energetically, creatively, spiritually, emotionally. Even just 10 minutes can do wonders to calm the mind and body. Take the stairs instead of the elevator up, even for just one flight. Try a short nature hike or a gentle sunset stroll with a buddy. Lace up those sneakers and step it up! Click here to view my cute little video! Session 3 – Week One: “Get Scrappy!” One of the best things you can do for improving your health is fueling your body with fresh, simple, whole foods. Making your own meals does take a little bit of work (planning & prepping) but knowing WHAT you are actually eating because YOU are the one who made the meal is incredibly empowering. So don’t be lazy, Get Scrappy! BONUS: You can save those scraps from your fresh veggies and herbs in a freezer-safe container to make your own delicious, healthy and super-simple broths and soup bases. Click here to view my cute little video! Session 3 – Week Two: “Don’t Quit!” The mantra I chose for this week is “I Am Not Giving Up” and I needed it big time. Yes, there are going to be obstacles in front of us from time to time. It’s OK and it doesn’t mean that we can’t still achieve our goals, big or small. If you are facing some obstacles on the way to your BIG GOALS, take a break and refocus. Maybe set some mini-goals in order to get your mojo back. Reset your mindset, make adjustments as needed, and remind yourself that you are not giving up. Click here to view my cute little video! Session 3- Week Three: “Choose Joy!” One of the most powerful things that we have control over in our lives is our attitude. Even when we are facing difficult circumstances or challenging seasons of life, we can still choose to hold a positive attitude. We don’t have to let each setback (a normal part of human existence) send us into an emotional tailspin or a defeatist mindset. We can CHOOSE to look at things differently. We can CHOOSE to accept what is, and we can CHOOSE to look for the gift, the blessing, and the JOY available to us every single day. Click here to view my cute little video! Session 3- Week Four: “Go Easy” Knowing when to go hard and knowing when to dial it back are vitally important to developing a sustainable health and wellness routine that is right for YOUR body. All of nature is rooted in cycles, so learning to honor our bodies and allow for restoration even in our exercise practice just makes sense. This week our focus is on allowing things to be easy. Give yourself permission to ease in, eliminate drama, and enjoy a more peaceful life wherever possible. Click here to view my cute little video! Session 4 – Week Two: “Dream Bigger” Your dreams chose you and are designed to delight you, challenge you, and fulfill you! If you are searching for meaning and purpose, look no further than the big, beautiful dream in your heart. Click here to view my cute little video! Session 4 – Week Three: “Unlimited” What would your life look like if you had nothing holding you back and no limit to the success you enjoyed? Too often, we place limitations on ourselves because we are afraid of what success might look like. 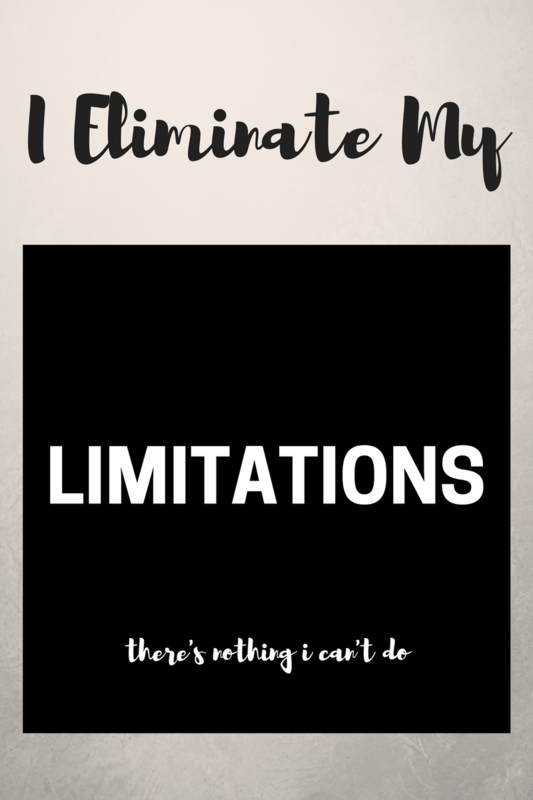 I want to encourage you to eliminate your limitations and create a more expansive experience of life! Click here to download the printable graphic! Session 4 – Week Four: “Share The Love” It begins and ends with Love. Love for Self. Love for Others. Love for those who are like us and for those who are very different. We are born from Love, created and fueled and sustained by Love. Remind yourself today that you are deeply, truly, perfectly loved, exactly as you are… and then share and send Love to everyone around you, because it is the only thing that really matters. Click here to watch my cute little video!